Yesterday an older gentleman stopped by while I was out in front of my studio, writing at my little café table. He’d been walking around town all morning and needed to rest for a bit before returning home. He asked if he could sit down. “Sure,” I said. I thought about how the town harbor must’ve bustled with people and trains and boats. It’s still a little bustly with the Badger running half the year here. 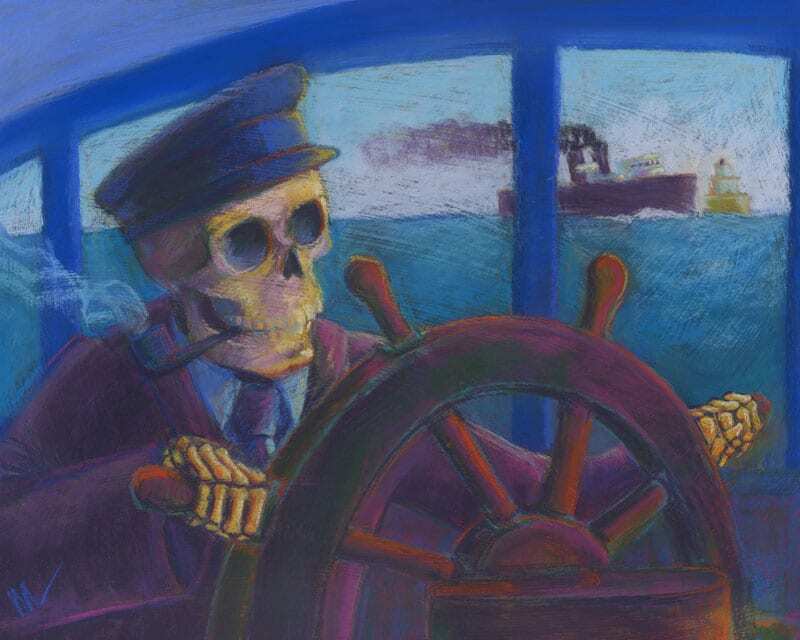 The man that sat down to talk didn’t ask about my skeleton art but I got to thinking about it and I wonder if he’d have liked the commission that I painted early this spring, about a skeleton carferry captain racing back to port. The owner of a local restaurant wanted me to paint a skeleton picture that had Ludington, the carferry and House of Flavors Restaurant in it. Oh, and could I do it in ten days because the giftee was leaving town? I’m a glutton for punishment so of course I said yes. As it turned out I also had to get the piece printed as a canvas wrap in time for the going away party, but once the original was done that part was easy peasy. I love it when a plan comes together! Bonus, it was a really fun piece to do. Do you suppose the old guy I was talking to yesterday would appreciate a card with that piece on it? If I see him again I’ll be sure to find out! Like my writing? Want to read more? Sign up for my newsletter! It’s quick and easy and you’ll get all my new posts delivered right to your mailbox! This entry was posted in art business, Skeleton, skeletons, skelly and tagged captain, carferry, carferry captain, skeleton, skeleton crew on August 21, 2018 by Marie Marfia.